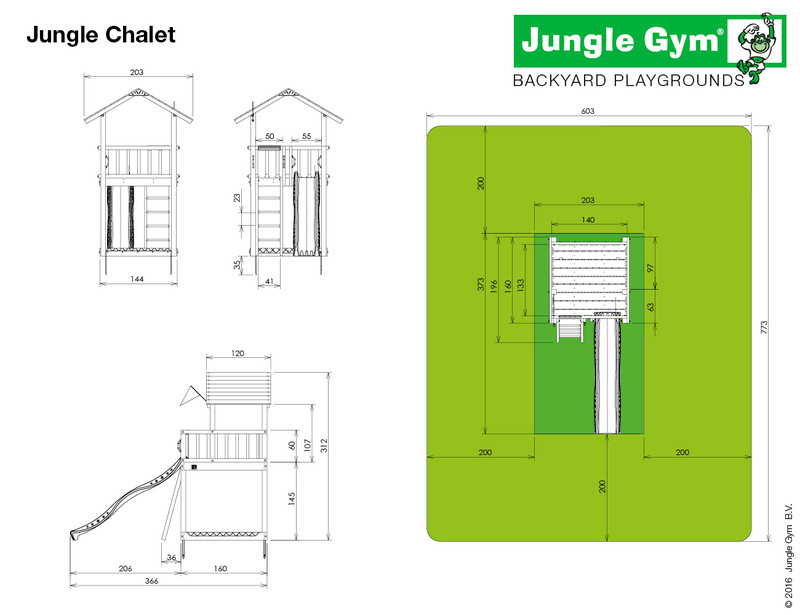 Easily connected to all wooden playsets, the Balcony Module gives your structure an extra dimension. The balcony offers a different perspective, looking over the rear or side of the wooden playsets. 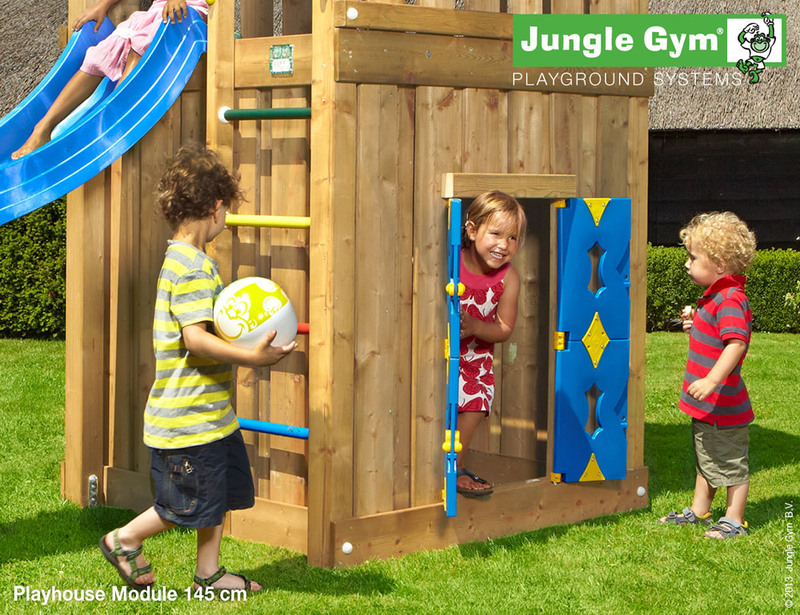 This module increases fun without compromising playtime security and requires no extra garden space. The included StarOscope™ provides extra visual stimulation and special corner cushions are an added safety feature. High quality, especially designed for children. We always use materials and finishes that are soft for the hands, provide maximum grip, and apply to the strictest health and safety requirements. With rounded edges and corners, weatherproof and UV-resistant. 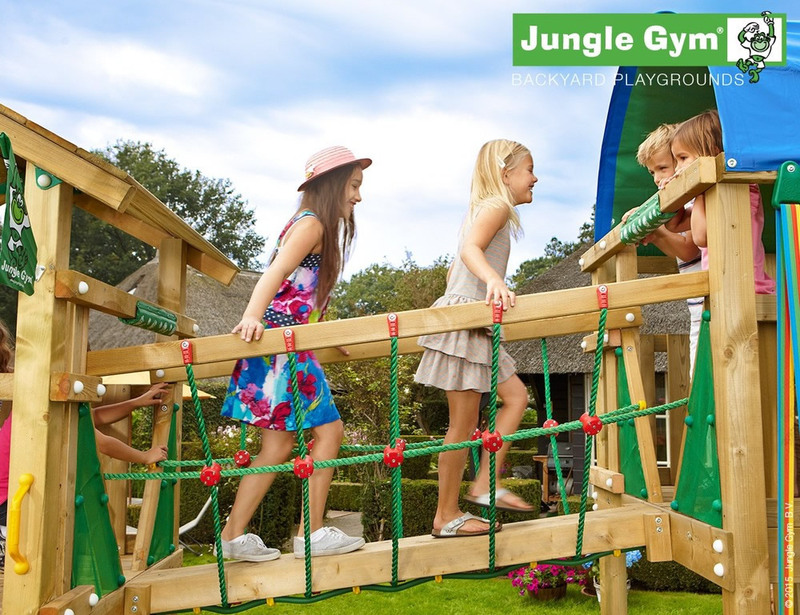 A wonderful way to combine two Jungle Gym garden play centres, the Bridge Link is easy to add and safe to use. 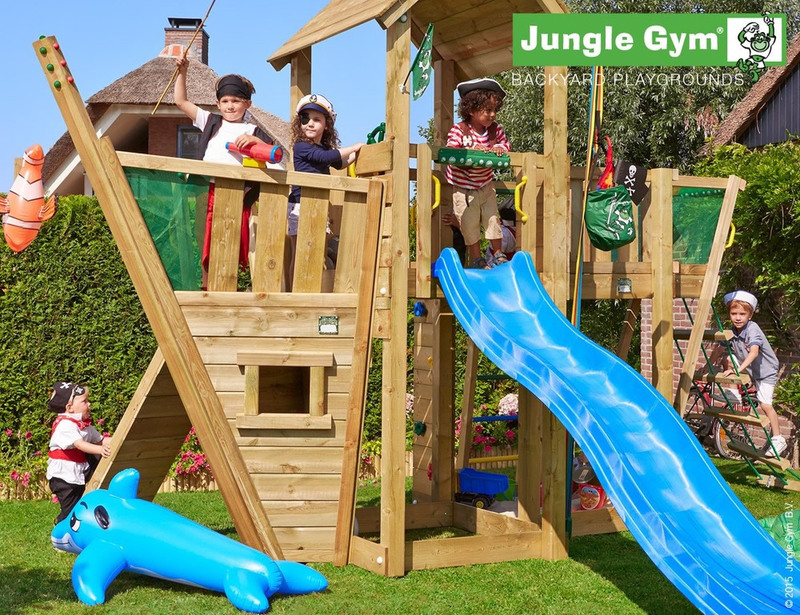 The Jungle Bridge’s flexible nature means children use focus and co-ordination as they pass from one garden play centres to another. 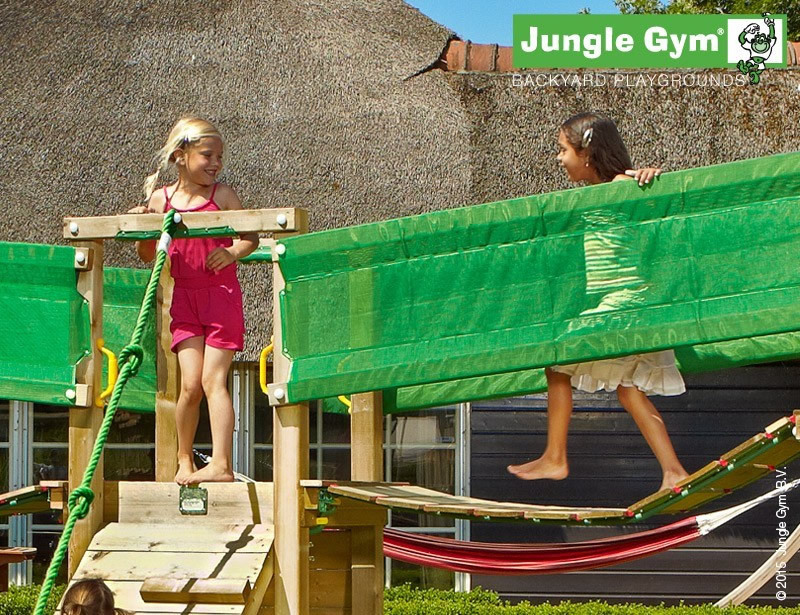 The inclusion of Safety Mesh on each side gives you peace of mind as your children make the most of their playtime. High quality, especially designed for children. We always use materials and finishes that are soft for the hands, provide maximum grip, and apply to the strictest health and safety requirements. With rounded edges and corners, weatherproof and UV-resistant. 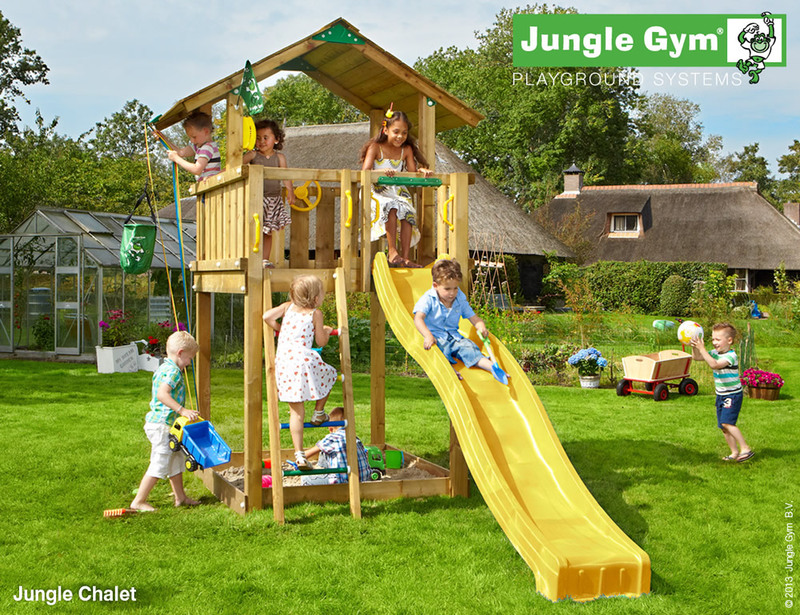 An exciting cave, an executive office or a country cottage, the Playhouse Module is an outstanding option for converting space into a playtime arena. Based on a wooden play house design, this module creates a sense of the indoors whilst outside in the natural environment. 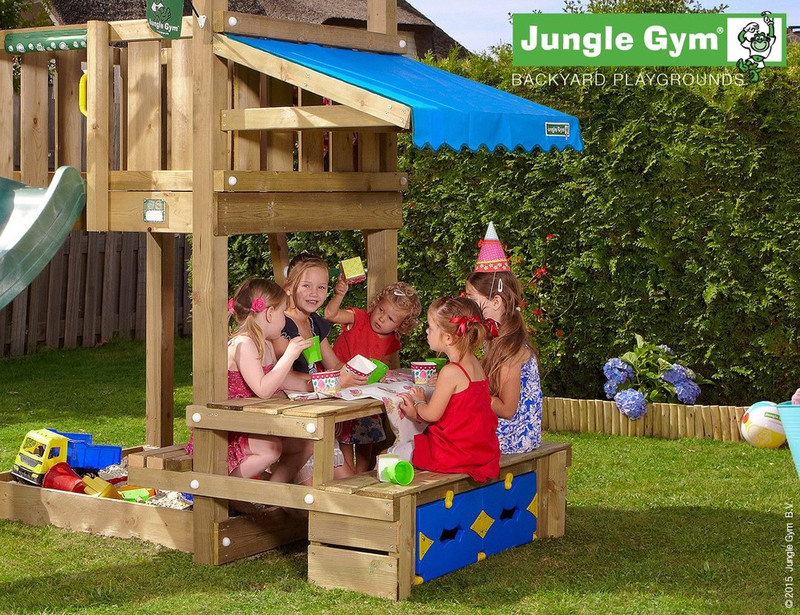 This wooden play house requires no additional space to be a part of your garden play set. High quality, especially designed for children. We always use materials and finishes that are soft for the hands, provide maximum grip, and apply to the strictest health and safety requirements. With rounded edges and corners, weatherproof and UV-resistant. 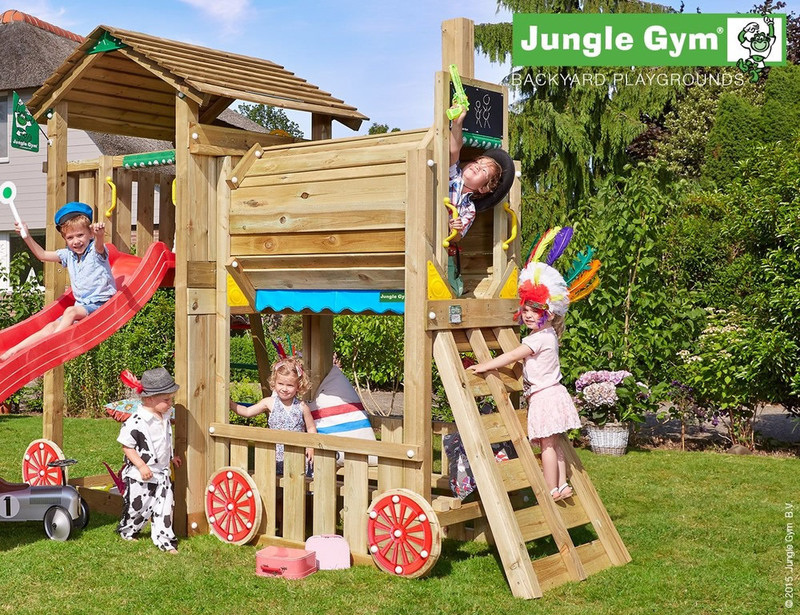 Easy and safe to add alongside any climbing frame, the play shop brings the world of commerce to your children’s playtime. Encouraging imaginative play whilst introducing the potential for numerical and communication challenges, this play shop is a perfect accompaniment to physical activities. The play shop has a awning and shutters amongst its features. 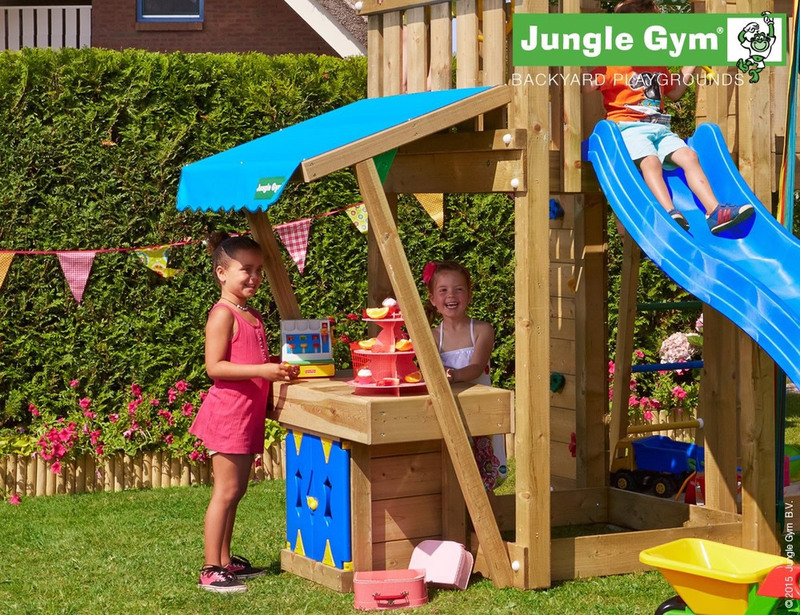 This Mini Market Module is the best choice if you wish to expand the options offered by your playground without increasing the space it requires. High quality, especially designed for children. We always use materials and finishes that are soft for the hands, provide maximum grip, and apply to the strictest health and safety requirements. With rounded edges and corners, weatherproof and UV-resistant. 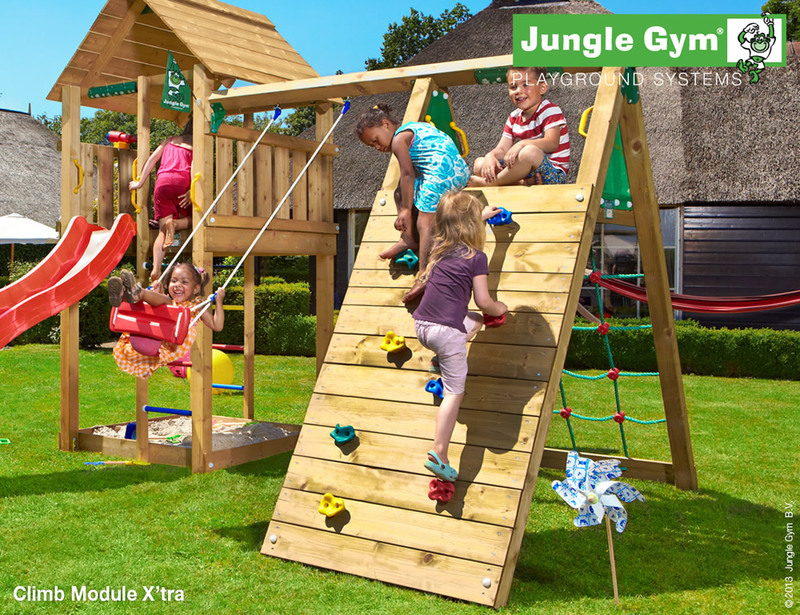 A new and exciting option for expanding your outdoor play centre, the Net Link helps to develop your children’s sense of equilibrium in a safe and fun way. A central beam runs underfoot, whilst two handrails offer support. 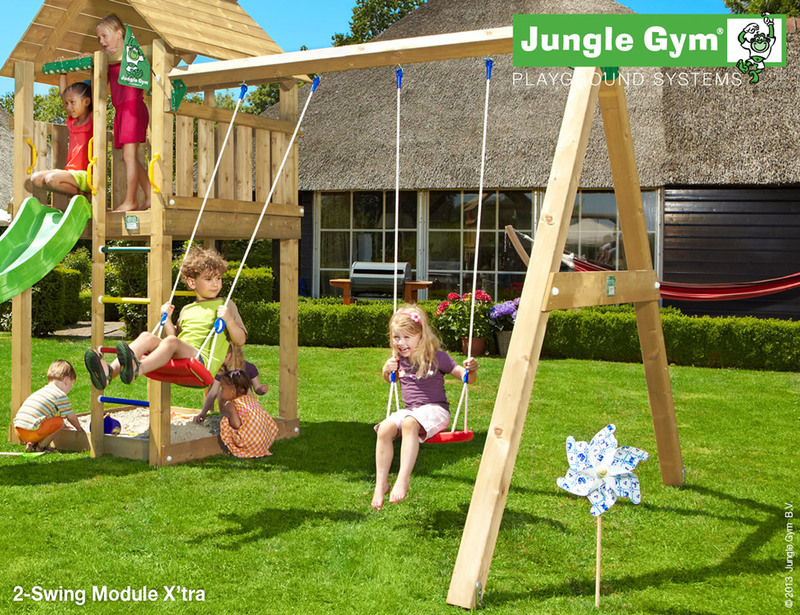 The crossed ropes on either side also provide safety with a touch of variety. A narrow connection, co-operation is encouraged as children take turns in crossing this link from one outdoor play centre to the other. High quality, especially designed for children. We always use materials and finishes that are soft for the hands, provide maximum grip, and apply to the strictest health and safety requirements. With rounded edges and corners, weatherproof and UV-resistant. This kids picnic table includes: a table, two benches, a Roof Tarp with valance and a cabinet to store all your toys. High quality, especially designed for children. We always use materials and finishes that are soft for the hands, provide maximum grip, and apply to the strictest health and safety requirements. With rounded edges and corners, weatherproof and UV-resistant. 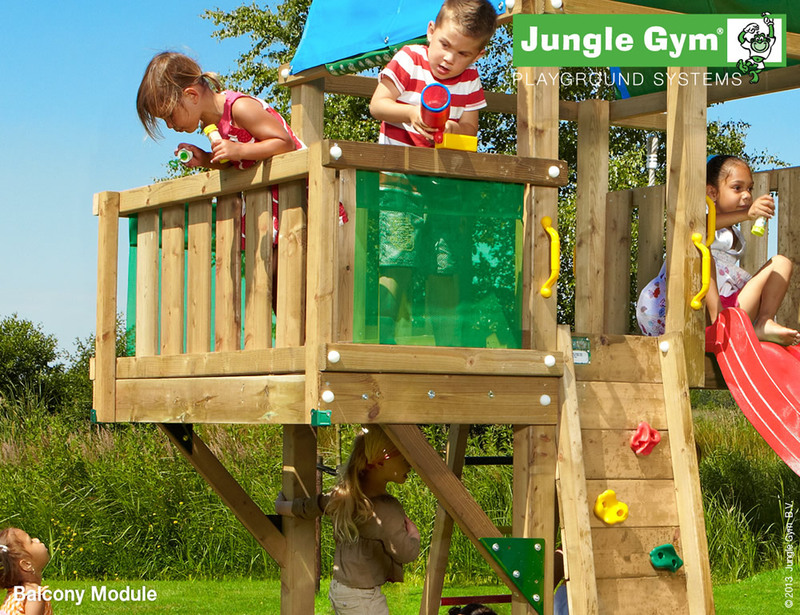 This module turns your favourite Jungle Gym into a super adventurous pirate ship, submarine, lifeboat, ferry or freighter. This design with realistic features as the pointy sun deck, fore cabin with window, ship’s wheel and StarOscope™ -telescope encourages every child’s imagination. The extensive climbing opportunities offered by the double wooden rope ladder and ramp with climbing rope complete this voyage. 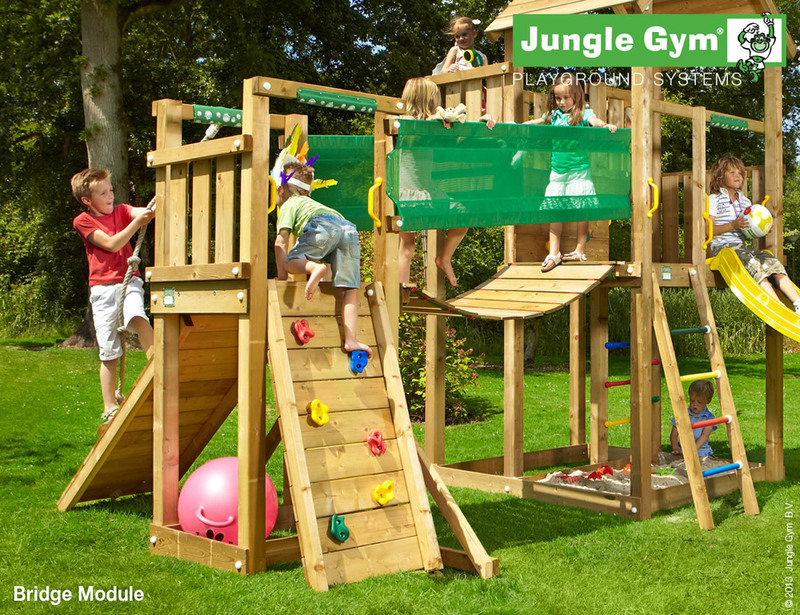 Climbing frames for kids are now more versatile and fun than ever! High quality, especially designed for children. We always use materials and finishes that are soft for the hands, provide maximum grip, and apply to the strictest health and safety requirements. With rounded edges and corners, weatherproof and UV-resistant. Climb up the climbing wall, crawl through the locomotive’s tunnel or find your passengers seat in the compartment below. This module makes your child’s most exciting railway dreams come true. The six super fast wheels, steering wheel and chalkboard turn your outdoor wooden playhouse into a new adventurous journey again and again. High quality, especially designed for children. We always use materials and finishes that are soft for the hands, provide maximum grip, and apply to the strictest health and safety requirements. With rounded edges and corners, weatherproof and UV-resistant.